Threatening the press: the mark of the desperate and guilty. "By now you're probably wondering why this post is appearing on Techdirt at all, as we don't make a habit of posting about seemingly legitimate intellectual property lawsuits." Even if this wasn't a legal issue against the press. I do find it refreshing to see a potentially legitimate copyright claim. Nice to see copyright law used in a legitimate fashion rather than a shakedown. 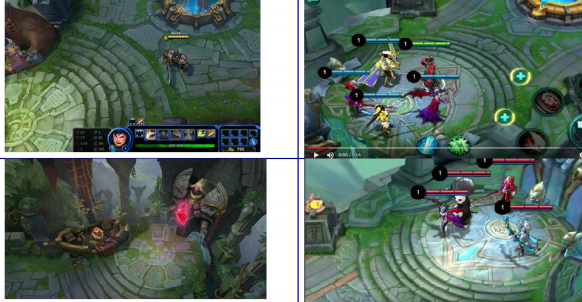 I skimmed through the pictures in the lawsuit itself, and it seems a bit silly to include that bit at the end where they show that users have left comments claiming the game to be a copy of League of Legends. And then they try to claim that as evidence that it is infringing. If I've learned anything from TechDirt and Popehat, it's that a random yahoo on the internet doesn't know much about the particulars of IP law. But maybe they only included it as evidence aimed towards the trademark claims but not the copyright claims? Official Statement: Recently some media have published negative and unreal reports against Mobile Legends. Here is the statement of Moonton. ... Mobile Legends and all the users will not be affected by these unreal reports and we will keep providing the best gameplay experience to players all over the world. So now they're trying to get sued by Epic too? Didn't check the comments but after looking at the Lux and Karna examples, it is easy to tell that someone was doing a lot of copying. I can see have 1 or 2 similar abilities when making characters but all 4 and it looks like they are just trying to cash in on Riot Games' success. Sorry, but look and feel and rules and game design -- are not subject to copyright. Only a very specific expression is. That means something that just looks "similar" is not infringing. There might be very well a case for infringement of so-called design patents (look & feel) or even trademarks, but if Moonton programmed its games themselves and made the artwork themselves, there cannot be a copyright infringement. Paraphrasing part of a work would be fine. This looks more like paraphrasing an entire work only by cutting a couple of corners and hoping people do not notice. Only a very specific expression is. Look in the screenshot attached to this article. Moonton is trying as hard as it can to copy the specific expression of “League of Legends” without directly copying it. Riot has an actual case here; whether that case succeeds depends on whether the legal system agrees with Riot’s claims. Are you sure they're not actually copying original code or assets? Some of that looks awfully similar. This is why it needs to go to court. "Unreal news" sounds so much fancier than "fake news". It's like the news came from some other reality, say like a video game. They should include a disclaimer to make sure people don't confuse this with news about the Unreal development engine or any Unreal video games, which could be considered "Unreal news". I'm quite sure. It doesn't need to go to court to determine whether they got a hold of the source code and modified it or if they explicitly copied assets. They didn't. It has to go to court because under copyright law, even making something from scratch that looks too similar can be found to be infringing. Though "comments from people saying these two things look alike" isn't enoigh even for a trademark claim. I'm aware. But at least in trademark it might be evidence that would be considered (though wholly insufficient on its own) instead of just non-sense that might leave a judge shaking his head, wondering what this bit is doing in this lawsuit filing. It could've been worse. They could have had a Trump spokesman Stephen Miller look-and-sound-alike telling the press that "Our opponents, the media and the whole world will soon see as we begin to take further actions, that the powers of the [company] are very substantial and will not be questioned." Moontown seems like a garbage company, but the question of whether or not you can copyright a mechanic is more important than they are. It would be a very troubling direction for the game industry to go if a judge established precedent here. I hate crappy iOS clones too, but sometimes you've got to take the bad with the good. That was a few years ago. Copyright is ratcheting up all the time. The title is introducing one point: That Moonton is making vague vacuous threats against the media. But the article starts off discussing the merits of the case. Whoever is in the wrong (one, the other, or both) on the merits is kinda irrelevant (as you say, above). My guess is that whoever drafted this didn't run it by a lawyer who's done any defamation work. Possibly, by any lawyer. 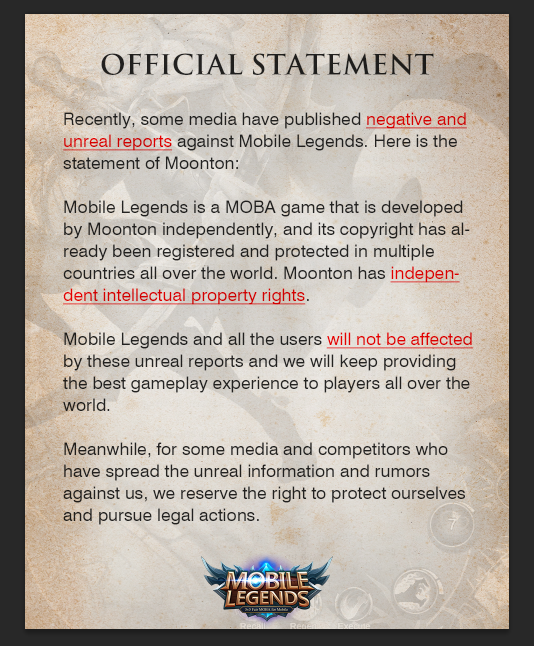 Sorry: "drafted this" - the Moonton notice, not the Techdirt article. They just never said they were inspired by any other games. The article mentions the lawsuit because the factual claims raised by said lawsuit are the basis for Moonton’s vague threats against the media (“for some media and competitors who have spread the unreal information and rumors against us, we reserve the right to protect ourselves and pursue legal actions”). Whether Moonton sues a specific media outlet seems to depend on whether that outlet continues to report on this lawsuit — which, I imagine, will continue to happen now that Moonton has run afoul of the Streisand Effect. Artwork is one thing, but rules and game mechanics are not even copyrightable. I wouldn't be able to differentiate the games and heck I've played enough games in my life to know that you can use an established genre and make it at the very least LOOK different. Easy win to Riot I'd infer. Sorry, but this is too close to the source material to be considered "fair use" or "different enough". All I see is a lighting difference on the map. That's far from "we didn't copy". That's "we copied and we did this one little thing to make it look different". That doesn't change the fact that the company ripped off League champions for Magic Rush (and they lost that lawsuit, by the way) and now they've ripped off the map (minimum, I haven't played the game to see how much else they copied) and have said "this is our own!". Montoon needs to be shut down if they're going to blatantly ignore copyrights in an attempt to piggyback off another company's popularity unfairly.